Every fish, shrimp and whale has special meaning and a positive message on this mural painted by students with help from John Donato. G.W. Carver Academy students from grades K to 12 painted these murals in the school. For some kids, it was an excuse to leave class. For others, it was a chance to paint past a bad day and inspire others having a tough time. George Washington Carver Academy unveiled five murals this month that are truly meant to make the school a better place. 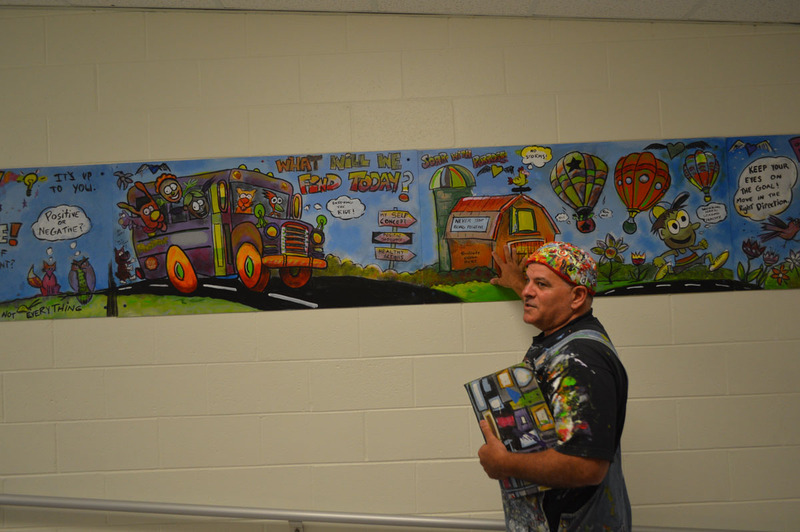 “Over the course of the 2016-17 school year, our students worked with local artist John Donato to create murals to display throughout school focusing on their work and positive actions … as well as utilizing art as a medium to represent themselves in a positive way,” said Principal Melissa Kansak. The Carver Academy is an alternative school in Frankford focusing on individual K-12 students’ academic, behavioral and personal needs in Indian River School District. It’s a transient population as students arrive or transition back to their home schools. About 65 students participated in the murals. “This was an area they all felt successful,” said counselor Whitney Price. Some murals were created in layers, very organically. Imagine a flock of 7-year-olds dripping and smearing paint on the boards, Donato said. That’s how the mural started. Next, the older children look for patterns and begin sectioning off the shapes that the first-graders had created. Finally, the teenagers used the loose patterns as inspiration. Did the colors remind them of Bob Marley? They researched inspirational song lyrics that relate to positive actions. The students really got to brainstorm over the artwork, since they worked on the murals for months, from January to almost the end of the school year in June. Donato usually comes to schools for a few weeks to guide mural creation, but this was more of a residency. With the art boards set up in the cafeteria, students could swing by during lunch or whenever they were having a tough time. The relaxed environment let them talk through their problems with Donato — or paint in silence until they had calmed down. Price was often there to help begin the conversation, and she helped train Donato on the school’s “Positive Action” curriculum, so they could better respond to students who had come to paint. He met with students one-on-one and in small groups at least once a month, and usually more often. 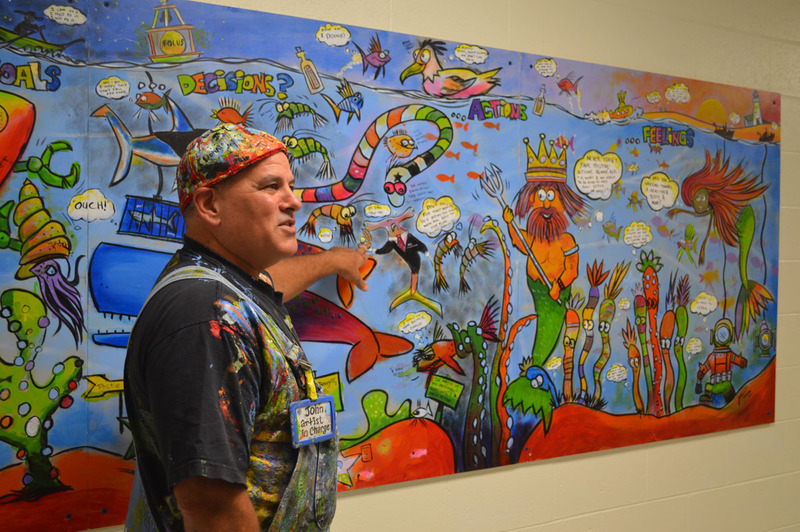 An ocean-themed mural really helped some kids dig through tough times. There are small fish trying to make their way forward in life; sneaking sharks and seaweeds that want to trap fish at vulnerable times; and wise mer-people and whales who encourage the fish forward to make good decisions. The mural reminds viewers to ask for help, think through their decisions and consider the impact of their actions, and also encourages them to help others having a hard time. These are life lessons that adults could stand to remember, too. Everyone also participated in bookshelf murals, which Donato commonly uses at the other local schools. Those murals resemble bookshelves, and everyone creates a positive-themed book spine. That applies to the country as a whole, too, he said. “Like the United States — it’s all in one, one country, so let’s stick together and help each other,” Sickle said. He got to serve as project documentarian, too, photographing the process from beginning to end. “Every one of these books is a completely different piece of artwork, inspired by a completely different set of situations and skills and ideals and moods, so you’re gonna get something that’s gonna be timeless,” as people absorb new details every time they pass by, Donato said. Price thanked the Carver staff — especially the custodians who helped bring the project to life. She also thanked Delaware Community Foundation’s Next Gen South, which provided grant money to make the project happen. Carver was one of 16 applicants and four winners.